A 32-year-old woman presents for evaluation of a murmur recently heard on physical examination. She has noted mild reduction in exercise capacity over the past 6 to 12 months. She has no known history of cardiovascular disease, although a murmur was reported early in life. On physical examination, the blood pressure is 100/70 mm Hg and the pulse is 68/min and regular. The estimated central venous pressure is mildly elevated; the jugular venous pulse contour demonstrates equal a and v waves. The apical impulse is not displaced. There is an impulse noted along the left sternal border. The S1 is normal. The S2 is split throughout the respiratory cycle. A grade 2/6 midsystolic murmur is noted at the second left intercostal space. There is a grade 2/6 diastolic rumble noted at the lower left sternal border. Both of these murmurs increase with inspiration. The remaining findings on physical examination are unremarkable. An electrocardiogram demonstrates normal sinus rhythm with normal axis and intervals. 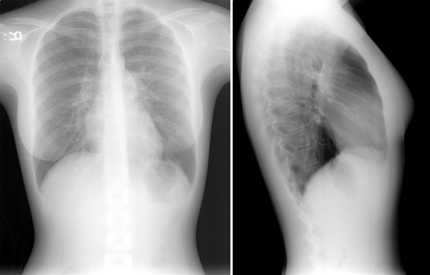 The chest radiograph images are shown. The correct answer is A: Atrial septal defect. This question can be found in MKSAP 15 in the Cardiology section, item 54. The patient presents with physical examination findings consistent with an atrial septal defect, which include fixed splitting of the S2, a parasternal impulse due to right-sided chamber enlargement, and tricuspid diastolic and pulmonary systolic murmurs related to the increased right heart volume from the left-to-right shunt. The right-sided murmurs increase with inspiration due to the increased systemic venous return. The chest radiograph demonstrates right heart and pulmonary artery enlargement, consistent with long-standing right-to-left shunt. The test of choice for confirming the diagnosis of atrial septal defect suspected on physical examination is transthoracic echocardiography. Hypertrophic cardiomyopathy is generally associated with a dynamic systolic murmur that increases with Valsalva maneuver release. The apical impulse is often displaced and bifid. A parasternal impulse would not be expected, and the S2 should be normal. The electrocardiogram in patients with hypertrophic cardiomyopathy demonstrates left ventricular hypertrophy. Patients with a left atrial myxoma may have a diastolic sound known as a “tumor plop” noted on physical examination. The S2 is normal, and a parasternal impulse would not be expected. A diastolic murmur related to an inflow gradient may be heard when the tumor obstructs mitral inflow. The electrocardiogram may be normal in patients with left atrial myxoma. A patient with pulmonary arterial hypertension manifests a parasternal impulse and a loud pulmonic component of the S2, which changes with respiration. The electrocardiogram in patients with pulmonary arterial hypertension demonstrates features of right axis deviation, right ventricular hypertrophy with tall R waves in the right precordial leads (V1 and V2) and deep S waves in the left precordial leads (V5 and V6), and, occasionally, a right ventricular strain pattern. Patients with rheumatic mitral stenosis classically manifest a loud S1, variable S2, and an opening snap, followed by a low-pitched diastolic murmur. In the setting of concomitant pulmonary hypertension, the S2 is loud and splits during inspiration but does not remain split during expiration. The electrocardiogram in patients with mitral stenosis demonstrates features of left atrial enlargement and hypertrophy. When pulmonary hypertension occurs, right ventricular hypertrophy is also demonstrated. The characteristic physical examination findings in atrial septal defect are a right ventricular impulse, fixed splitting of the S2, a pulmonary mid-systolic murmur and a tricuspid diastolic flow rumble.